William Quincy Belle: Freedom = no rules. No rules = anarchy. On April 30, 2013, a 5-year-old boy shot and killed his 2-year-old sister in Kentucky. (Washington Post) It was a tragedy, but a headline like this certainly stirs the pot about the issue of gun control. In the wake of other shootings, certainly Sandy Hook and the death of school children, there has been much debate about guns and what can be done to reduce violence in America. While proposals to enact new laws governing firearms like background checks seem to be supported by the majority of the public on both sides of the political divide, the pro-gun lobby, a strong and vocal minority in the U.S., managed to quash recent attempts to reform gun control. Later that day, I received two replies to my original posting. @wqbelle How many children died this year from other negligence? I bet you don't know because you only care about guns. These two gentlemen raised issues I had talked about elsewhere so I tweeted back to both of them links to two other articles I had written about gun control. 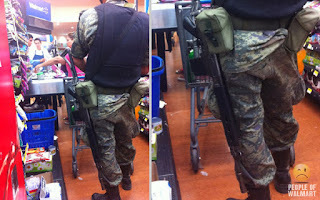 In the first article, "Guns: as American as Apple Pie", I discuss an incident where a man, armed with a concealed handgun, accidentally discharges his firearm while standing in a checkout line at Wal-Mart. It turns out that he had a permit to carry a concealed weapon so him having the weapon was perfectly legal. Gun enthusiasts pointed out the man's mistake as he did not have a holster and had not properly secured his gun. Case solved. Case closed. But I asked the question why anyone would be armed buying milk in Wal-Mart. Is Wal-Mart so dangerous, am I risking my life by shopping there? In the second article, "Sandy Hook, Gun Control and the Right Answer", in discussing the shooting at Sandy Hook, I asked what the collective we, society, should do for the benefit of the many. I compared this to driving a car. I must pass a driver's test. I must follow the rules of the road. I am not allowed to speed; I must wear a safety belt; and I must come to a full stop at all red lights and stop signs. One could argue that I am not totally free, but I point out that by giving up some of our so-called freedom, we have order instead of chaos on the road. I also point out that what I am calling freedom here - running a stop sign - isn't freedom to do what I want; it is the freedom to make mistakes. If everybody drove as they wished, speeding or running red lights, I think we can easily see we would have anarchy, a very dangerous anarchy where driving would certainly be risking your life. I point out that the collective we, the government, has enacted laws to control our driving to ensure we all have the safest experience on the road. The government isn't controlling where we go; it is merely controlling how we do it. Drive safely and have a good trip. The government wants us to get where we want to go safe and sound. I don't play golf. I have never been bitten by the bug so I could care less if I ever played the game in my life. As a consequence, if the government stepped in right now and closed every golf course in the country, I would not be personally affected. However, I would consider such a move to be draconian and would fight for the right of everyone to play the game. I don't own a gun. If the government outlawed every gun in the country, I would not be personally affected. However, I would consider such a rule to be draconian and I would fight for the right of everyone to pick and choose what they do. But, and here is the big but, like driving, I think the collective we has the duty to enact laws which govern how anybody conducts themselves. The good of the many should outweigh the good of the few. Can I buy a gun and shoot it off in the middle of Times Square? Of course not, that's not safe if not just plain crazy. Laws making the wearing of safety belts mandatory came into effect in the late 1970s. My brother took the stance that the government was interfering with his freedom and he was going to be goddamned if he would wear one. We were having this debate while I was driving and he was a passenger. He wasn't wearing his safety belt. I slammed on the brakes. He slid off the front seat but managed to get his hands up to stop himself from going into the dashboard. "What the F did you do that for?" I looked at him with a slight grin and replied, "If you had been wearing your seatbelt, that wouldn't have happened." Of course, he wanted to kill me but the point was made. In theory, if everybody drove safely, none of us would need to wear a safety belt and yet we all now know instinctively that driving around without one would not be just foolhardy, it would be suicidal. So I come back to any gun enthusiast. 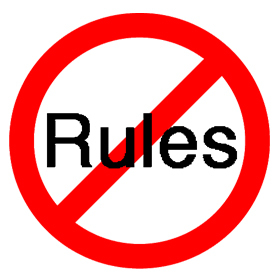 What is the matter with a few rules? What's the matter with a background check? Anybody has to pass a driver's test before they are allowed to drive a car. What's the matter with proving you are a responsible gun owner? What's the matter with limits on gun clips? I'm not allowed to drive a Formula One race car on a city street. Should I be allowed to have a 100-round drum semi-automatic Uzi in my home? On the other hand, I can go to the race track and drive my Formula One. If I do have an Uzi, I should be allowed to go to some special shooting range. I walk into Wal-Mart to buy milk while carrying a concealed weapon. How free am I? I have never owned a gun in my life and I have never been in a situation where having a gun would have been useful. I'm not a policeman. I'm not a drug dealer. I'm not a secret agent chasing a bad gun. I walk into Wal-Mart packing heat and that shows I'm free? Just how dangerous is Wal-Mart? Is somebody going to unholster their sidearm if I take the last quart of milk? Am I going to be exchanging fire in aisle three in order to get a package of barbecue wieners on special? This is the United States we're talking about, right? This isn't Afghanistan or Iraq? At the end of this article, I have put together some videos made by Vice Magazine. Their coverage of guns in America is quite eye-opening. I am sure your average man or woman in the street has no idea to what extent guns pervade American culture. Yes, we are familiar with television and movies but what about gun shows, gun clubs, and speciality business catering to those who want to be trained in using a firearm? America: armed and dangerous. In the second video " Shooting Guns at a World-Class Firearms Facility", you watch one of the videographers being trained to shoot attackers in his own home. What struck me as curious is that the scenario involves evil doers arriving on your doorstep and you must dispatch them in order to save your own life. Is the United States that dangerous? Is the U.S. still the Wild West or does everybody merely perceive the U.S. as the Wild West? Are we paying attention to the right things? Yes, I admit it is possible that a bad guy shows up at my door but how probable is it? Am I paying attention to the real dangers in my life? It is possible that an asteroid hits the Earth and destroys my home but guess what? I find that so improbable, I have never purchased asteroid insurance. my blog: Stephen Colbert: And the #1 threat in America: terrorist furniture! In the June 21, 2012 episode of The Colbert Report during the segment entitled "Threat Down", our humorous pundit declared the number one threat in America to be terrorist furniture. Referring to an article in The Atlantic which in turn refers to the recently published 2011 Report on Terrorism by The National Counterterrorism Center, Colbert notes that of the 13,288 people killed worldwide by terrorist attacks in 2011, seventeen were private U.S. citizens or 0.1%, one tenth of one percent of the total. The article, in referring to a 2011 consumer report, states that in 2010 (the last reported year) twenty-one people died from a falling television, piece of furniture or an appliance. 17 American citizens killed by terrorist attacks in the U.S. in 2011. Did you know that according to the CDC (Center for Disease Control), 82 people are killed each year by lightning? (CDC: lightning) Are we paying attention to the right things? Are we aware of the real dangers lurking around in our lives? Mr. Allen raises two points in his tweet. I only care about guns? Negligence in any form is bad. But I would point out how the author, like many of the pro-gun lobbyists are trying to deflect attention from the current discussion. According to the CDC, 574,743 people died from cancer in 2010. Would Mr. Allen suggest we forgo a discussion about guns to turn all of our attention to cancer? I can pull up any one of a number of issues, cancer, AIDS, famine, etc., whose numbers are greater than the number of homicides in the United States but am I always going to change the subject? Am I always going to deflect any talk of gun control because I can find a more pressing issue? In 2009, 31,347 persons died from firearm injuries in the United States (Tables 18 and 19), accounting for 17.7% of all injury deaths that year. The two major component causes of all firearm injury deaths in 2009 were suicide (59.8%) and homicide (36.7%). But, I don't want to skew the numbers. In this report, homicide is listed last on a list of 15 causes of death in 2009 behind such notables as heart disease, accidents, and other diseases. However do I put guns aside because I can claim other issues are more important? Mr. Allen raises a good point about how many children died from negligence and other forms of mistreatment. The CDC (Child Maltreatment) estimates that in 2008, 1,740 children died from abuse and neglect with 80% of those deaths occurring among children younger than 4 years old. This is a good point. Do I pay attention to a headline about the gun-related death of one child without giving any weight to the problem of child abuse and neglect? Or is the headline of this child's death shining a light on the over 31,000 gun-related deaths annually in the United States? Does anybody click on the links in tweets? Shortly after having posted a tweets with a link to my article "Guns: as American as Apple Pie", I received back the following reply on Twitter. His response tells me two important aspects of our little back and forth on Twitter. The very fact that this gentleman brought this up tells me this debate is not a legitimate debate, this is a question of brinkmanship. Can he one up me? Can he best me with the next sardonic comeback? Can he pick apart any argument I may have by finding fault in some piddly detail? Secondly, I am convinced he never bothered to read my article. Our debate doesn't involve the thousands of words I wrote about my perspective on guns; it is limited the 140 characters of Twitter. I have noted time and again in the political arena, instead of having an honest debate about a subject, we are drawn to style not substance. If you look good, if you sound good, you've won. And when I say sound good, I don't necessarily mean being logical, insightful, or well-informed. If you have witty banter, if you've got a comeback zinger, you may win the debate but not because you're on the side of truth, justice, and the American way. In part reaction to the Port Arthur massacre in 1996 which saw 35 people killed and 21 wounded by a man with a history of violent and erratic behaviour, the country enacted strict gun controls laws along with a buyback program. A survey showed up to 85% of Australians supported this move. The collective we wants to do something to have a better and safer society. Unfortunately, competing interests are fighting it out as to just what is the best course of action. I do not believe that anybody truly knows what the right answer is for the majority over the long-term. I believe that making safety belts mandatory for all citizens is a good thing. Yes, there are the few who complain that the government's laws are encroaching on their civil liberties but when these people are in a head-on collision and go sailing through their front windshield, it is obvious and I mean oh so painfully obvious they are really asking to be free to make mistakes. I'm being kind. In that case, they are asking to be free to be stupid. What is the so-called "right answer"? Gun enthusiasts want to keep their guns. Critics want a safe country without the fear of mass shootings or misfires in the checkout line at Wal-Mart. Is there a "right answer" which is going to satisfy everyone much in the same way we all agree (the majority of us?) that mandatory safety belts are a good idea? No background check? Don't I have to pass a driver's test before I get my license and am allowed to drive a car? Limits on magazines or the type of gun allowed? Am I allowed to drive a Formula One race car on a city street? I don't think responsible citizens should be penalised for the irresponsibility of other people but on the other hand having no regulations doesn't protect me from those irresponsible citizens. A driver's licence and mandatory safety belts are ways of protecting me, of protecting all of us. I don't want a yahoo behind the wheel of a car anymore than I want a yahoo to own a gun. The problem is that you want to take my freedom because of someone else's negligence. NO. I don't want to take away the freedom of a responsible citizen. I want to restrict the actions of an irresponsible citizen. I may be presumptuous but I am assuming Mr. Sorrentino would want to do the same. I will close by pointing out the following. When the government makes me pass a driver's test, follow the speed limit, stop at red lights, and wear my safety belt, they are not restricting my movements; they are not taking away my freedom. They (the collective we = government) are merely trying to ensure my journey is safe and I arrive at my destination. That I would classify as freedom: the freedom to not make mistakes out of ignorance or end up dead due to the irresponsibility of somebody else. Anarchy has more than one definition. Some use the term "anarchy" to refer to a society without a publicly enforced government or violently enforced political authority. When used in this sense, anarchy may or may not be intended to imply political disorder or lawlessness within a society. When a passenger dies in a car accident that is the result of negligence, there are usually serious legal consequences for the driver. If we really want to reduce gun violence, there must be consequences for negligent gun owners, too. The entire culture of gun ownership has to begin emphasizing safety in a way it doesn’t now. It is as important as universal background checks, or limits on magazine rounds. All three of the following video episodes are excellent. I have just watched all of them and I think the third one summed it up quite nicely. Just like abortion, gay marriage, and other hot button legal issues, it is nearly impossible to convince someone that his or her opinion about guns is wrong. We went to Arizona to shoot some absolutely ridiculous and unnecessarily huge guns. Thomas gets a lesson in heavy artillery at the Big Sandy Shoot, where gun enthusiasts gather in Arizona's western desert to test their rifles, canons, and machine guns. We went to a world-class firearms training facility near Las Vegas to fire off some rounds and discuss American gun laws. After so many recent mass shootings, we decided to travel to Florida to see why so many Americans are stockpiling firearms. Weeks before the almost unfathomable mass shooting at Sandy Hook Elementary in Newtown, Connecticut, VICE editor-in-chief Rocco Castoro visited Florida to dive headfirst into its byzantine firearms laws and discover why his home state was the first in the nation to issue over one million concealed weapons permits. Through interviews and time on the range with veterans, law enforcement officials, and gun-store owners, VICE digs deep into the gun debate and uncovers many troubling revelations along the way. Oh, we also use a Craigslist-like site to arrange for the purchase of a handgun at 10 PM in the parking lot of a big-box hardware store. And it's all 100-percent legal. Welcome to Florida.